Lostock Skips are the specialists when it comes to North West skip hire, so if you’re looking to hire a skip for the first time, we can provide you with as much guidance as you need. Here at Lostock Skips, we provide skips to suit the requirements of domestic and commercial clients alike. Our skips are available in an assortment of sizes, starting from 2 cubic yards and ranging all the way up to 40 cubic yards. From skip hire Chorley and Leyland to skip hire Bolton, Preston and Wigan, our services are guaranteed to suit every project and budget. What’s more, we make sure that waste is disposed of correctly and can help you to get the most out of your skip hire. 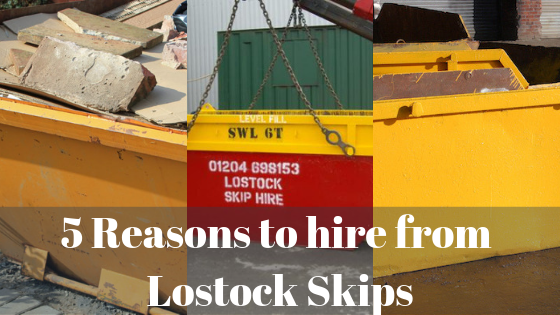 When it comes to skip hire, you can count on Lostock Skips to provide you with exactly what you’re looking for. With skip hire Chorley, we arrange to deliver skips to a location of your preferred choice and at a time that suits your needs best. Once your skip is full, we collect it as soon as we can, allowing you to concentrate on completing your project. When we collect skips, we take them to the local sorting facility – saving you the hassle of transporting it yourself. In offering an efficient service, we can help you to get rid of waste quickly and easily – could you benefit? Are you planning on having a clear out? Undertaking garden DIY? Moving to a new house? Renovating your property? These are all reasons why you should hire a skip from Lostock Skips. The skips that we provide for skip hire Wigan, and many other areas, are great for all kinds of projects. They are suitable for storing different types of waste and we ensure you receive a bespoke service. When hiring a skip for the first time, it can be almost too easy to select the first skip hire company you discover. Hiring a skip is a great alternative to taking waste to the landfill site – helping you to avoid increased landfill taxes. In addition to this, we make sure that 80-90% of waste is recycled – making skip hire Wigan environmentally sustainable. The cost of skips varies depending on a number of factors, ranging from skip size, hire period and location. At Lostock Skips, we aim to provide a cost-effective solution for all customers, regardless of where you are based. Waste disposal isn’t ‘cheap’ and if it is then this should ring alarm bells. We are registered waste carriers which means that we are licensed to transport skips and the contents inside safely. To keep the cost of your skip hire Bolton, Chorley or Preston low – make sure that you adhere to skip hire regulations. Our traceable fleets are used to deliver skips to all locations – including Leyland. They allow you to track the whereabouts of your skip and ensure that you’re home when it arrives. The fleets that we use for skip hire Leyland incorporate the latest technology and are designed to transport skips of all sizes safely. They allow us to deliver skips in plenty of time for you to start your project and we make sure that they are collected at a time that suits you. If you’re not entirely sure which skip you need, our team of experts are always on hand to help and will be more than willing to offer their expertise. To find out more about hiring a skip from us at Lostock Skips, call us on 01204 698 153 today.